Other tungsten carbide products: Tungsten Carbide Powder, Tungsten Carbide/Cobalt Powder, Tungsten Carbide/Nickel/Chromium Powder, etc. Thermal sprayed coatings of Tungsten carbide materials in a cobalt matrix offer the best wear protection. For service that requires better corrosion resistance, a matrix of nickel, cobalt-chromium, or cobalt-chromium-nickel is good choice. Materials with a higher percentage of matrix produce coatings with better ductility, resulting in improved impact and fretting resistance. Conversely, a lower percentage of matrix offers greater hardness, resulting in better abrasion and wear resistance. 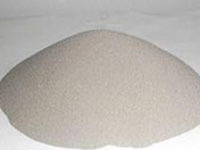 WC/Co/Cr powder is particularly applied to thermal surfacing techniques, such as powder welding, flame spraying, plasma spraying, HVOF (high velocity oxy-fuel). Our products is clearly tagged and labeled externally to ensure efficient identification and quality control. Great care is taken to avoid any damage which might be caused during storage or transportation.